IOSH Managing Safely is the world’s best-known health and safety certificate course for managers and supervisors. And with the version 5.0 syllabus now available, the all-new eLearning version of the course from International Workplace is the most engaging and accessible yet. Studying IOSH Managing Safely by eLearning is the perfect choice for anyone who wants to fit their study in around their busy schedule. The engaging format includes audio, video and animations, with an optional voiceover or captions if you want to work in silence. Our new interactive workbook builds as you progress through the course, capturing key points and any notes you’ve made along the way, so you have a comprehensive, customised revision guide before you take the end of course assessment. You’ll have access to our course administrators, tutors and technical support team for the duration of your course, as well as a bank of FAQs, questions and answers from fellow students in our learner community. For organisations looking to deliver the course to a larger team by eLearning, we also have an enterprise version of IOSH Managing Safely available for distribution via your corporate LMS. "Best online distance learning programme"
"Run this course in your LMS"
Put yourself in control: apply your branding, manage enrolments, create cohorts, and report on performance. 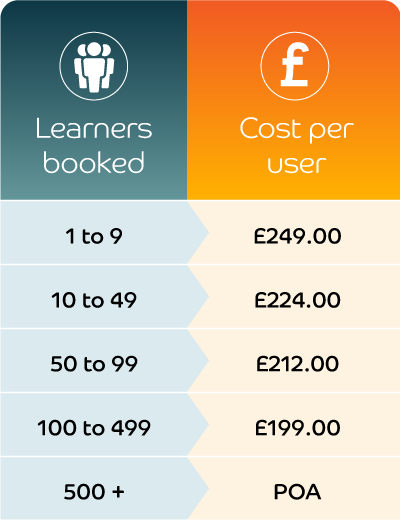 Save money: up to 65% cheaper than classroom courses, and discounted rates when you buy 10 or more licences – see our special offer for even bigger discounts if you buy before 28 February! Cut carbon: choose eLearning to reduce travel, improve flexibility and cut wasted resources. The IOSH Managing Safely course has been designed for managers and supervisors in any sector or organisation, anywhere in the world. It provides them with an introduction to the basic principles of health and safety at work, giving a practical insight into the most common workplace hazards, how to assess the risks, and how to manage them. On successful completion of the assessment and work-based project, you will be issued with an IOSH Managing Safely Certificate by the Institution of Occupational Safety and Health. The course is based on the latest version 5.0 syllabus, published by IOSH in June 2017. It requires 22 hours of study. A risk assessment based project that completed after the online assessment and submitted for marking. IOSH Managing Safely eLearning is studied online via the International Workplace Academy website. The course has been designed for use on PCs, laptops and responsive devices including Apple and Android tablets and smartphones. In the interests of security and performance it is always recommended you upgrade to the latest supported version of your chosen web browser. An enterprise version of the course is available for business, which can be delivered via the International Workplace online learning platform, or through integration with the client organisation’s LMS and/or reporting system. Please contact us for further information. In consultation with UKIE, appointed to the UK Government’s panel on accessibility in gaming and online learning, the course has been designed to be user-friendly for people with cognitive impairments, and to enhance the learning experience for people who find traditional ‘written word’ learning challenging. The course contains audiovisual content, including videos and animations, and an optional voiceover. Audio settings are controlled by the learner. The course can be completed without audio if desired: all audio content is captioned. Note that use audio controls may be impacted on Android devices as a result of software restrictions. As course provider licenced by IOSH to deliver the course, International Workplace must retain control of the course content, and the progress and performance data of users on the course. However, our systems have been developed to make the end-to-end process as seamless as possible for corporate clients. For organisations wishing to use International Workplace’s LMS we can apply your corporate branding to the system. And we can integrate with LDAP and ADFS single-sign-on systems or any of the authentication protocols supported by simpleSAMLphp, to allow their users to access the LMS without the need for additional login. For organisations with their own corporate LMS, our use of Tin Can xAPI (the modern replacement for SCORM) to provide tracking allows us to launch the course from your LMS for a seamless user experience, while tracking remains under our control. And our reporting API ensures you can import progress data back into your own system. Offline study Supports offline study: if internet connection is lost during study then progress and performance data will be stored offline temporarily until a connection becomes available. Data security Data and services hosted within EU data centres unless specified otherwise by the client.